Hello, some might recognize me from the EU warfronts. I am the guy wearing somewhat bad gear which melts those full relic rank 90's away like they were swiss cheese on a sunny day <chuckles>. I have long held the position of ranked 1 in my diamond league and thought I'd share my experience. There is only so much I can do to help however, and in the end the best spec for you is one that suits your gamestyle. What you don't want to play in a warfront is any kind of spec that puts most of the points in inquisitor, cabalist or druid. I have toyed around with all of them and Inq & Cab die too easily. Druid is worthless at everything except leveling up a character, has a lot of interrupt spells intended to bring down healers, but lack the damage to do so. When you spec for your role, remember that 10% Spellpower -> 5% Damage -> 10% Wisdom (unless wisdom is over 2k). I take it you've read or already understand what's being said in this thread and this thread. Most important is to always mark the healers. Now when it comes to gear you do not want spell critical hit (not even for PvE). Even if you wore 10 items with +98 spell crit that would still only mean roughly 7% spell crit chance increase. Being able to crit often does not mean anything when your base damage is low. Now what you want however is Spellpower, Vengeance, Crit Power & Endurance. But don't overestimate spellpower & vengeance, the damage increase is minor at best. 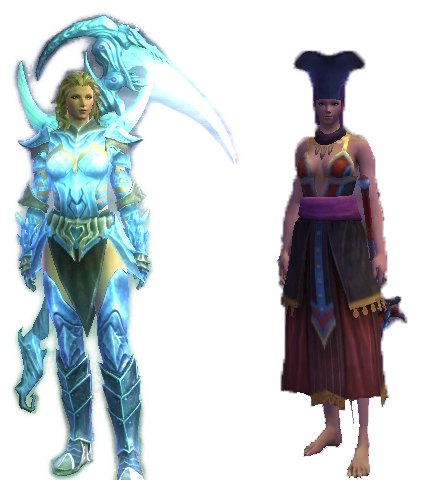 For instance let us compare two pvp items of the same type I have in my bank. Personally I like a healthy mix of both, since shaman & oracle are squishy and already have a decent damage output. Don't stand out, seriously make yourself as ugly as possible. The wardrobe gear to the right is something I'd wear in a warfront, I also tend to swap wardrobe gear in the middle of warfronts. Because once you are well known to other pvpers they will either avoid you (less kills) or focus you down (being charged by 5 warriors at once). Worst thing you can do is make yourself into a shiny yellow beacon, that will let everyone know who to target after healers. The smoother your game runs the better. The last thing you want is frameskips & lagspikes in a warfront, play on slightly lower settings as long as you don't have noticable dips in your framerate. Only thing you don't really want to lower in graphic settings is Pixel Granularity, since anything below 100 turns the game into a blurry mess. Gadgets, Gadgets: Buffs, Gadgets SCT, Rift Meter & Conquest Tracker are about the most useful ones. Is basically Ahov's shaman spec. However as a pvping shaman (unlike a raiding shaman). You get kited a lot and that's where those 5 points in oracle really shines. 1. You use the Oracle Synergy Crystal, +300 damage with Ice Emblem. 2. You get Ice Emblem which does roughly 2000 more damage than Ekkhards Grasp. 3. Ice Emblem increase the damage by 6% of the next attack. 4. You use the Oracle Synergy Crystal, +120 spellpower when you use Inspirations. 5. 1x Blood Insignia will pop Inspiration of Survival, giving you +345 spellpower +1% critical hit chance for 20 sec. There is a lot more to this spec then meets the eye, and just trying it out for a day or two will not let you master it properly. No, it doesn't beat the first spec in damage output. But you rarely ever die in this spec. Whenever you are even slightly below health and you find yourself running, you should use "Wrath of the Maelstorm" as it will heal by quite a lot. 1. Bolt of Radiance which has more damage than Ekkhard's Grasp, yes it has a cooldown but just place it before Ekkhard's Grasp in the macro. 3. Marrow Harvest = 5% more damage taken for 30 sec. 4. Siphon Vitality = Damage + Health Regain. 5. Salvation + Glory of Chosen + Wrath of Maelstorm = Nice heals. Right, this spec is great if you want a good ranged dps spec. But you need to do a lot of kiting and play quite defensive for it to work. Unless you have a personal healer, then this spec would be "GODMODE". Now, you curse everything around you until you see someone at around 30-50% health. Then you pop "Battle Fury" and kill them with Glacial Insignia. However, if you fail to kill them you are somewhat of a sitting duck. 2. Emblem of Alacrity + Bolt of Depravity = 1 sec cast time. 4. 15% speedbuff for everyone. There are some spells that will give you that edge in a warfront. First off you want a spam macro for shields along the lines of this. You want to incorperate "cast Soul Crystal" into most attacks you spam. Elixir of Impunity requires twilight blossoms & catalytic essence to make. It will work as a second break free & grant immunity. Now, all other classes get a good spell from their attunement of war. Cleric's get one called retribution, which is not instant like all other classes, it's not even close to as good as the one rogues get. But when you want to mess with a healer it still has it's use. "Transfers 10% of all healing used on the enemy to the Cleric. Lasts 15 seconds." Kind regards from Cey and let the nitpicking begin. Thank you for sharing about your experiences with different builds. I am a level 55 Cleric and am interested in your ranged spec Oracle. May I obtain your rotation and play style for that spec? 41 Oracle/28 Justicar/7 Inq is better PvP spec for solo queuing. 61 Inq/8 Oracle/ 7 Defiler will trump them all at P90. I am not really sure how you find any of them to have better survivability than 61 Inq though. Right, sorry for not replying quick enough. That guide was good and show roughly how the ranged oracle spec works. Personally I would make some minor adjustments to the Blood Heretic. Emblem of Pain is not amazing. 4x more points in War Mentality (instead of just 1x) for 5% damage in total. The bonus of this is that everyone on your team deals more dmg to all your opponents, not just the guy your focusing on, which frankly beats 5% healing. But also that Seeping Curse trait will mask your Wasting Insignia spam. Hopefully they will cleanse Curse of Fraility/Consumption instead of Wasting Insignia. It also gives you more time to spam Wasting Insignia. It's a matter of preference, but why you pass up on AoE interrupt however is beyond me. Inquis dies too easily? Umm... you might look at that again.